At this site on August 15, 1870, the last spike was driven into the first continuous transcontinental railroad. 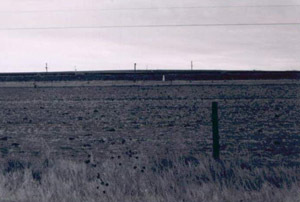 View of Comanche Crossing marker in 1970. The completion of railroad bridges over the Missouri and Mississippi Rivers allowed all rail transport over this route. An unpretentious white monument marks the spot which is named for a nearby creek crossed by the railroad. The property is associated with the Railroads in Colorado, 1858-1948 Multiple Property Submission.